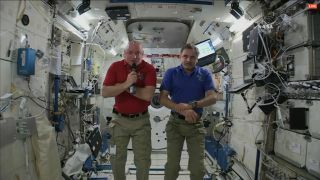 One-year space station crewmembers Scott Kelly (left) and Mikhail Kornienko (right) talk to reporters on April 28, 2015. A robotic Russian cargo spacecraft won't make it to the International Space Station as planned this week, but astronauts aboard the orbiting lab say the failure is not the end of the world. Russia's unmanned Progress 59 space freighter suffered a serious malfunction shortly after launching on Tuesday (April 28) and will plunge to its death in Earth's atmosphere in the coming days. The spacecraft is carrying more than 3 tons of supplies for the crewmembers aboard the orbiting lab, but none of this cargo is absolutely critical, said Russian cosmonaut Mikhail Kornienko. Kornienko is one of the six crewmembers who make up the space station's current Expedition 43. He and NASA astronaut Scott Kelly are one month into an unprecedented yearlong mission that's designed to help pave the way for journeys to Mars and other deep-space destinations. Like Kornienko, Kelly expressed confidence that the Progress 59 failure won't hamstring space station operations. "We have a lot of redundancy onboard the space station. The program plans for these kind of things to happen. They're very unfortunate when they do, but we do have supplies on board," Kelly told reporters Wednesday. Other robotic cargo vessels can pick up the slack, he added, citing SpaceX's Dragon capsule, Japan's H-II Transfer Vehicle (HTV) and Orbital ATK's Cygnus spacecraft. "Long-term impact, both programs are looking at that right now," Kelly said, referring to NASA and the Russian space agency, known as Roscosmos. "But I think we're going to be in good shape." Russia’s robotic Progress 59 cargo spacecraft launches atop a Soyuz rocket from Baikonur Cosmodrome in Kazakhstan on April 28, 2015. Progress 59 suffered a serious glitch and will fall to Earth soon. SpaceX holds a $1.6 billion deal with NASA to fly at least 12 resupply missions to the station using Dragon and its Falcon 9 rocket. The company is midway through mission number six; all of the flights have been successful thus far. Orbital ATK signed a $1.9 billion NASA contract to make eight unmanned cargo runs to the orbiting lab. The company's first two flights were successful; the October 2014 launch mishap scuttled mission number three.